Dispute Resolution (how do the parties to a PPP contract resolve the disputes which will inevitably arise during the life of a long-term project). Many countries (such as India, South Africa, and the United Kingdom) have had considerable success in developing standardized PPP contracts for use in their own countries, with different types of contracts for each sector. However, there are considerable problems in trying to do this on an international basis, given the variety of PPP transactions globally; the different legal, regulatory, financial and institutional frameworks which exist in various countries; and the need to have tailor-made provisions to deal with the individual characteristics of complex PPP projects. At the same time, though, the WBG believes that there are certain provisions in almost all PPP agreements on which there is a strong consensus of opinion as to what constitutes internationally-accepted good practice. The 2015 Report is an attempt to capture that consensus, and reflect it, in the form of recommended contractual language, accompanied by explanatory notes. It should be stressed that the language set out in the 2015 Report is not meant to be prescriptive. In other words, the recommended provisions are not mandatory clauses which must be used whenever a project is being supported by the WBG or any other organization. Instead, the recommended provisions are just that – they are recommendations on contractual language that has been found to be appropriate in many PPP transactions in a number of countries. The 2015 Report is based on an initial draft prepared by the Paris-based international law firm of Gide, which was commissioned by the WBG using a grant provided by the multi-donor Public-Private Infrastructure Advisory Facility (PPIAF). That initial draft was discussed at the PPP Days event which was held in London on June 16-17, 2015, and the draft subsequently benefited from a number of contributions by law firms, expert commentators, and by members of the G20. The draft report was also extensively reviewed by lawyers within the WBG. The 2015 Report is meant to be a first step in an ongoing process, with further editions being published as consensus continues to develop around the provisions described in the document and other provisions commonly found in PPP agreements. As part of that process of consensus-building, the WBG is working with the Monetary Authority of Singapore and with the G20’s Global Infrastructure Hub to encourage the dissemination and discussion of the 2015 Report among PPP stakeholders. On October 19, 2015, the Government of Singapore and the WBG co-sponsored an Infrastructure Finance Industry Roundtable event in Singapore, at which government officials, project developers, lenders and advisors considered the 2015 Report. Similar events are now being planned in other regions. 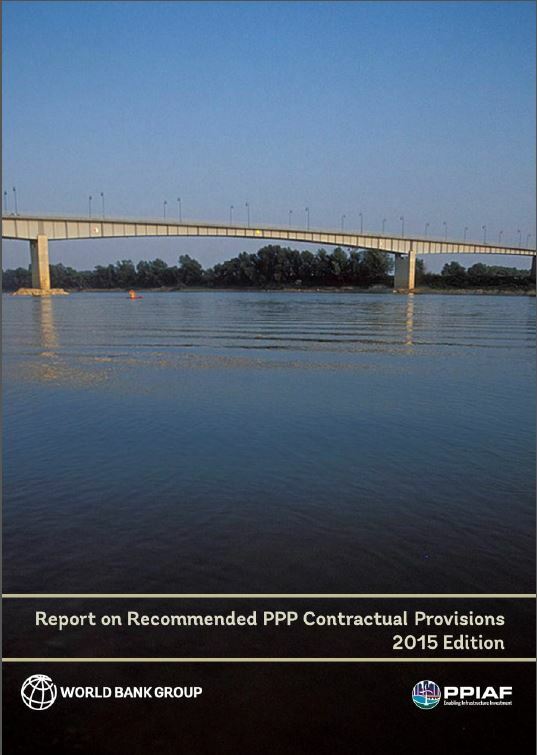 The 2015 Report is available for public comments on the website of the Public-Private Partnerships in Infrastructure Resource Center (PPPLRC) at http://ppp.worldbank.org/public-private-partnership/library/wbg-report-recommended-ppp-contractual-provisions. All comments, suggestions, and other feedback on this initiative would be most welcome.